How Will a Disability Lawyer Handle my Claim? 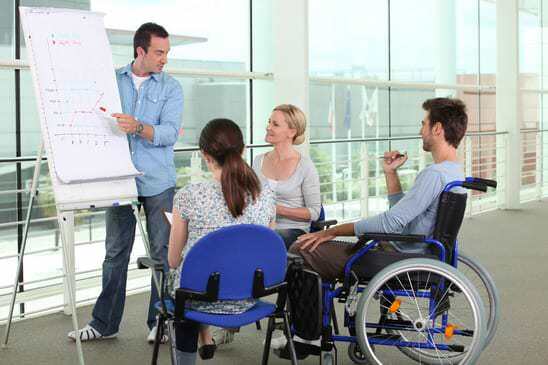 All lawyers and firms work differently when handling disability claims for their clients, but there are certain similarities in how they all manage and prepare cases in preparation for a disability hearing. 1) IN THE BEGINNING: First off, either by phone or in person, the disability lawyer or a member of their staff will conduct an interview with you to get all the basic facts and information about your cases. This is also what initially helps them decide if they will even be handling your case. If it is their staff member interviewing you, don't worry, they're trained to recognize the signs of a case that will have great success. If the staff member thinks your case is border line or "special" then the lawyer will review it themselves. If the lawyer thinks your case would be a hard one to win, they'll probably decline representing you. 2) PREP AND DEVELOPMENT: Now, your lawyer or staff member will request and collect all of your medical records( see: How Do I Prove My Disability to the Social Security Administration? )You will be asked to sign a medical privacy release allowing your attorney access to your medical records. The lawyer will usually pay for these records until the end of your case at which point, you will be billed for them. Your lawyer will also decide what to do with bad evidence that could hurt your case. 3) WHAT DO I DO DURING ALL OF THIS: It is not uncommon for your lawyer to not contact you in person until just before the hearing. Although, you may request an in person meeting at any time. Their staff will usually be in contact with you from time to time about any additional information, items, or actions they need from you. However, in the mean time take it upon yourself to be prepared by continuing to see your doctor during your claim. This helps to maintain accurate, up to date, and helpful records for your case. Also, remember to answer all questions that are asked of you by your lawyer or staff member as honestly and as accurately as possible; even if you're embarrassed or ashamed of the answers. It's the only way they can help you effectively. Also keep in mind, that they are INDEED THERE TO HELP YOU, not to judge you and that all information is privileged. You may also always ask why they need certain information for your own understanding. 4)CAN I GET A WITNESS: You may bring a witness to your hearing. However, leave it up to your attorney whether such a witness will actually help or harm your case. Lastly, your lawyer will ask you a series of questions at the hearing known as the "hypotheticals". The hypotheticals are designed to rule out the possibility that you can work any kind of job due to your condition. I think if the individual abuess the system (just using that phrase makes this argument feel a little false, but I think you know what I’m getting at here) continuously, they forfeit the right to privacy, but that brings into it the point you made at what point do you say hey, YOU no longer deserve the right to privacy? That’s where none of it works and the whole thing needs a facelift. It’s all a little much. I do like your idea of the EBT system, but that too, would bring in a need for complete overhaul. I think the way it is now allows for everybody to point fingers in one direction or another and say this is too expensive for one reason or another.